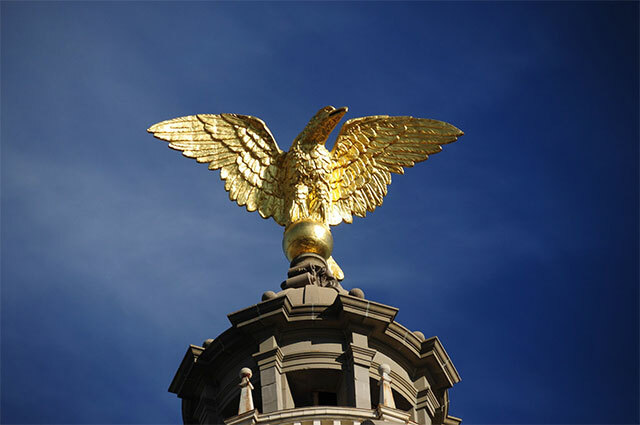 JACKSON — The eagle atop the Mississippi Capitol has a new golden glow. Craftsmen recently coated the statue with a fresh layer of 23.75 karat gold leaf. That’s about $10,000 worth of material manufactured in Italy especially for this project. The work is part of an overall restoration of the 112-year-old statehouse, designed to keep the building in good working shape for decades to come. The eagle is made of copper and has always been covered in gold. Although it looks considerably smaller from ground level, the statue is 8 feet, 5 inches tall from its base to the top of its wings and is 14 feet, 2 inches wide from the tip of one wing to the tip of the other. Craftsmen from a Maryland-based company, Gilders’ Studio, used chemicals to strip away the gilding that had been put on the big bird back in 1980. They needed only 3 ounces of gold leaf to cover the eagle’s entire textured surface — beak, feathers and all. How much is 3 ounces? Imagine the weight of a small apple. The layers of gold are 100 times thinner than a human hair, said Michael Kramer, founder and president of Gilders’ Studio. Lawson Newman, a Jackson architect who is overseeing the Capitol restoration, said before the eagle was regilded this time, workers drilled two small holes in it — one at a shoulder and one at the bottom — and inserted a light and small camera to check its steel interior. Newman said it is structurally sound. During Capitol restoration projects in 1970 and 1980, the eagle was removed by helicopter and taken off-site to be regilded. This year, crews erected steel scaffolding all the way to the top of the dome and built a sort of temporary room around the eagle, complete with a roof, walls made of mesh windscreen and floors made of wooden planks. Gold leaf resists ultraviolet sun rays that damage most exterior surfaces, Kramer said. But, hail and birds can be rough on a gilded surface. Newman said parts of eagle had been scratched by birds’ claws and damaged by their droppings. The process of stripping away old gold, applying adhesive and applying the new layer of gold to the eagle took about a week, with five craftsmen from Gilders’ Studio. Kramer said working up high and outside, in a breeze, is “invigorating.” And, compared to some of the artisans’ past projects, working on this scaffolding was a relative luxury. To apply a new layer of gold leaf atop the Georgia Capitol in the late 1990s, they dangled from ropes and rappelled down the dome as they worked. Workers started last year on the most comprehensive restoration of the Mississippi Capitol since the late 1970s and early 1980s. The $8.3 million project includes waterproofing to fight leaks that have plagued the building for years. Stained glass windows are also being removed and taken to a Jackson glass studio for thorough cleaning. The contract to restore the eagle was worth about $46,850, including material and labor. To pay for the restoration, legislators approved $6 million in bonds during the 2010 session, another $900,000 in bonds during the 2013 session and nearly $1.4 million in cash during the 2014 session.